Jeffersonville, affectionately referred to as “Jeff” by locals, is a hip city in Clark County known for its diverse range of dining and shopping. 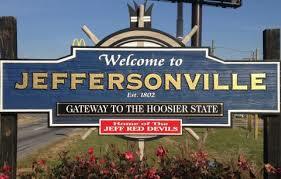 Jeffersonville began as a simple settlement of a different name until 1801, when President Jefferson took office. During the Civil War, Jeff occupied a prestigious location as one of the main gateways to the South. As such, it was elected as one of the primary bases of the Union Army. The advent of the locomotive industry contributed to Jeffersonville’s growth, and in June 1864, The Ohio Falls Car and Locomotive Company was founded. After myriad ups and downs, including multiple bankruptcies and and even fires(! ), the company merged with other car builders to form The American Car and Foundry Company in 1899. During both World Wars, the factories served the respective war efforts in many ways, including producing shirts, nose forgings for shells, castings and the like. In 1945 the plant closed for good and the buildings are currently being utilized by businesses, now named Water Tower Place. Because of Jeff’s proximity to the Ohio River and to Louisville, shipbuilding (and more specifically, steamboats), became a large part of the local economy. The Howard Ship Yards operated from 1819 until after the Second World War. The history of the steamboat industry in Jeff can be found at the Howard Steamboat Museum. River Ridge Commerce Center ©, located in Jeffersonville and Charlestown, is a major contributor to economic growth in the area. Studies have shown that it generates roughly $1.3 billion of overall economic impact and $388 million in labor income.